The Bears are heating up the NFC North this season and now the team has set its sights on warming Chicagoans in need this winter. 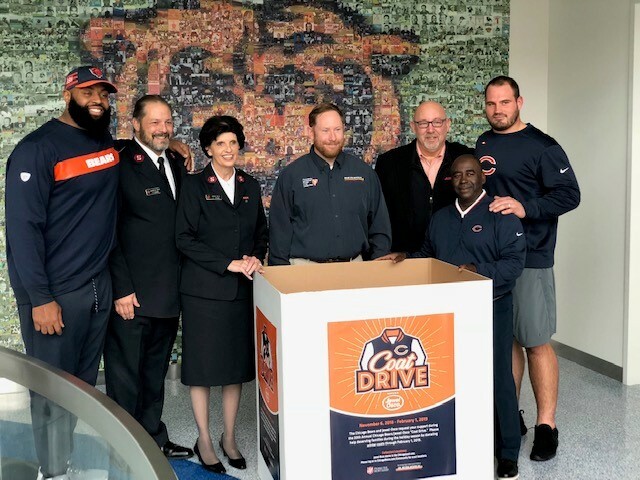 In a press conference at Halas Hall this Tuesday the Chicago Bears and Jewel-Osco announced the kick off of the 30th annual coat drive to benefit The Salvation Army. The coat drive runs through February 1, 2019. New and gently used coats can be dropped off at any of the 187 Jewel-Osco locations across Chicagoland. Coats for children and women are in the greatest demand. This strong partnership, now in its 30th year, collects coats throughout Chicago and the suburbs for Salvation Army clients in need. Chicago winters can be miserable for everyone, but for many of the people we serve, they are life threatening. People who are homeless, families who can’t afford to pay their heating bills, even children just walking to school can risk getting frost bite without the proper clothing. It may seem like a small thing, but when you donate a coat to someone in need, you are truly making a difference. You are keeping a child warm on his way to school. You are keeping a mother warm while she waits on the bus. You could even be saving a life. The Salvation Army, conducts daily outreach to homeless individuals with warm meals, coats and blankets. We invite them in out of the cold with and offer them shelter and treatment. And at our Family Stores, we give away coats… thousands and thousands of coats.…coats that are donated through this coat drive. Last year we collected more than 21,000 coats, along with hundreds of hats, gloves, scarves and snowsuits. This year, our goal is 25,000 coats. If you are in need of a coat, please contact your local Salvation Army Corps Community Center or call 773.353.8607. Coats will be available starting NOVEMBER 19, 2018.